Since I have dumped the 3 color mixing part the title of the above thread does not apply and especially as I head off in a new direction. 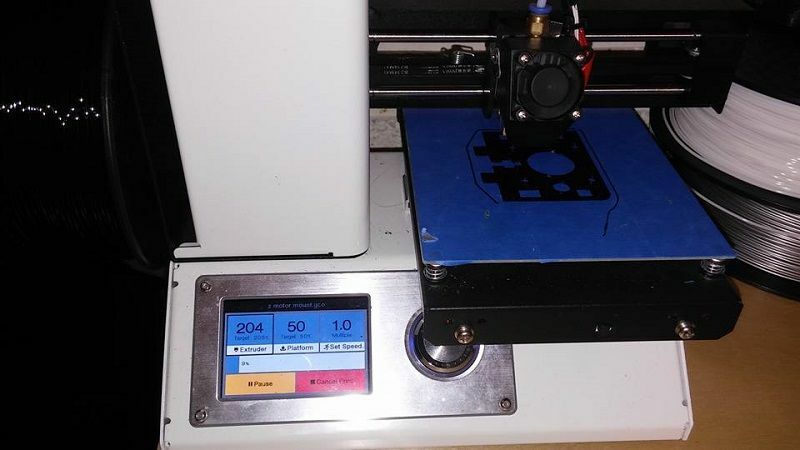 I now have 3 printers all connected to and driven off of 1 pc on a workbench I have dubbed the creation station. I now seek to be able to control these 3 printers from my car or my job or even other computers in my home. So the first step is to do away with the manual bed leveling and height adjustment. Then I will mount a webcam to each printer. And finally I will setup and run repetier server to give the desired results I am looking for. Or at least that is my theoretical roadmap. We will see how this unfolds. I have printed out some sensor mount/fan funnels for the mk8 extruders 2 of my printers have. Pictures are coming tonight. I took the lazy approach to printing a mount for the proximity sensor. I searched for it instead of designing my own. I looked at a bunch of different designs and went with one that I liked. 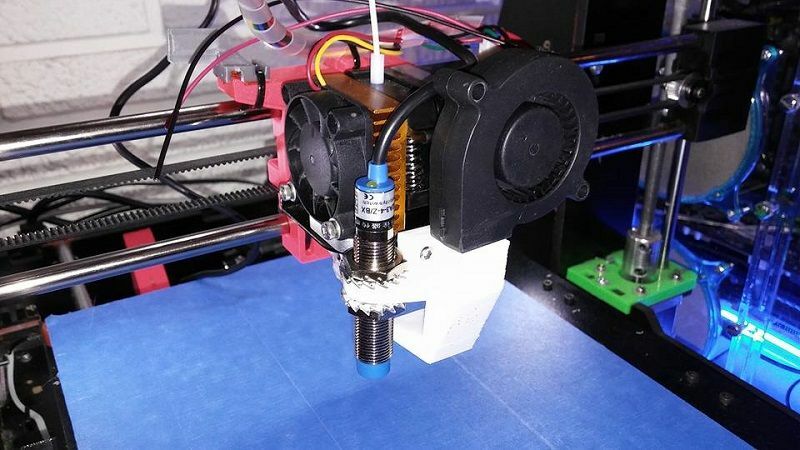 It also holds a 5015 fan and blows air on the filament that leaves the hotend..
Aside from being able to print while away from the printer this will complete the removal of all micro switches from my homemade printer. 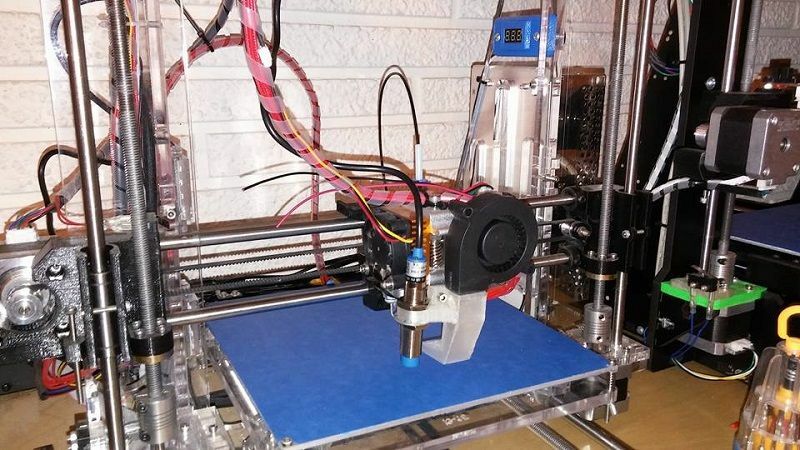 It has min and max optical end stops for y axis. optical min for x axis and now just a proximity sensor and aluminum bed for z axis. Tonight I wire the sensors in and begin trying to figure out how to set this up in marlin. And here is the same mount printed in clear to match the printer frame.. While I have the sensors mounted on 2 printers I am only wiring and changing firmware on 1 at a time. And I am starting with the homemade printer, Printilicious. The proximity sensor runs on 12v and the megatronics 3.0 board like all others uses 5v for it's sensors/end stops. So To resolve this I used a 10k and a 15k ohm resistor and made an in line voltage divider attached to the output wire of the proximity sensor.. I took this as a weekend project and all of my dvom/multimeter/labscope and related diagnostic equipment is at work. 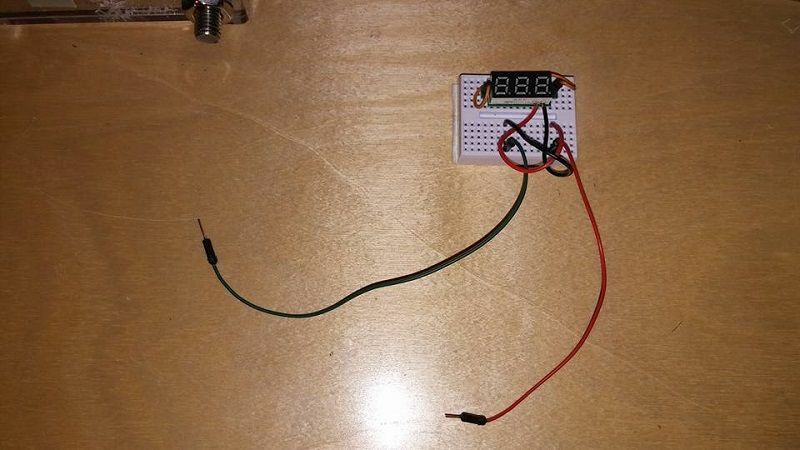 So here is my makeshift voltmeter for testing my circuit.. I got a stack of these tiny digital volt gauges off ebay a while ago and have used them for various projects. 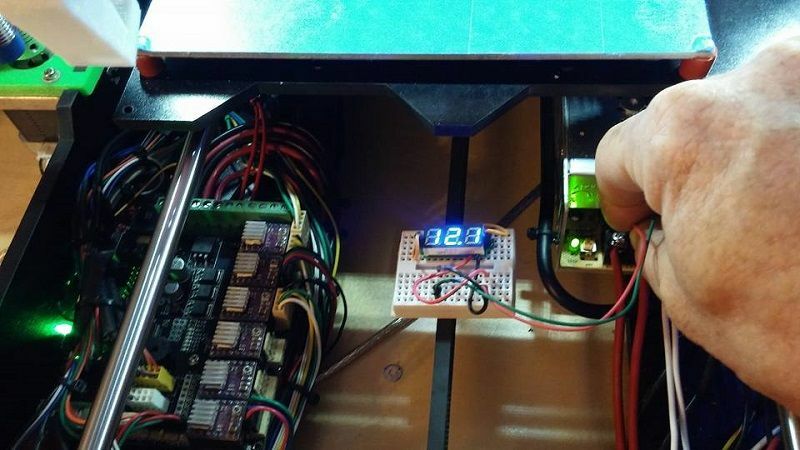 There is one mounted to each printer just so I can easily monitor the 12v output of my power supplies. They work great..
And today I am struggling with the trial and error of marlin settings. Still have some fine tuning to do but here is homing and leveling action with the new sensor..
Last edited by AutoWiz; 02-05-2017 at 03:58 PM. I had this thought as I was fine tuning the first printer. At some point i'm going to want to do away with all the multi colored parts on my printers. While to me they resemble different spools of filament and different waves of evolution and designing and building, to others it might more resemble a child's toy. It is no problem because I save .stl files for everything I have made or downloaded so it is just a matter of reprinting a handful of pieces in black and transparent. But to install these pieces will mean substantial printer teardown and ultimately having to redo all the fine tuning I was working on. So I started printing parts.. The transparent really ends up translucent. The process of printing out the filament makes creating a perfectly clear part impossible..
Gotta go toss these parts in. If you are running them all from one computer. Why not just use usb cables and teamviewer to access the computer ? Not as tecchie, but just as effective. These days I can even use teamviewer to access tablets. Just change printing ports in your software to access different printers? 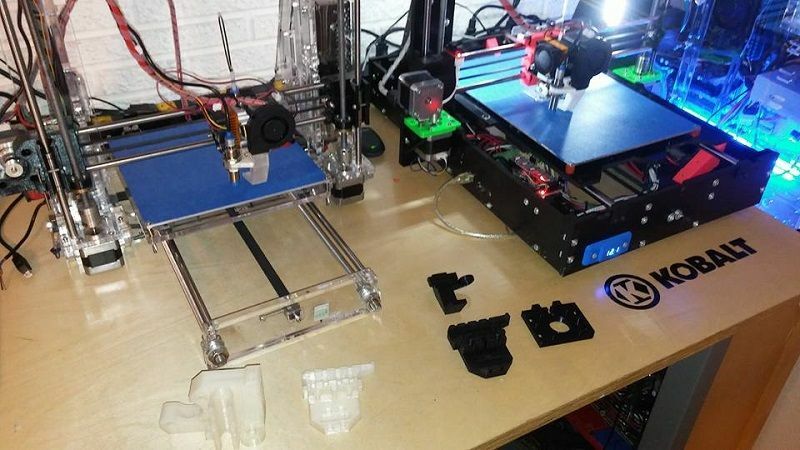 Does Octoprint handle the concept of multiple printers? It would be cool to be able to initiate multiple prints at once just by associating print jobs to printers/ports. 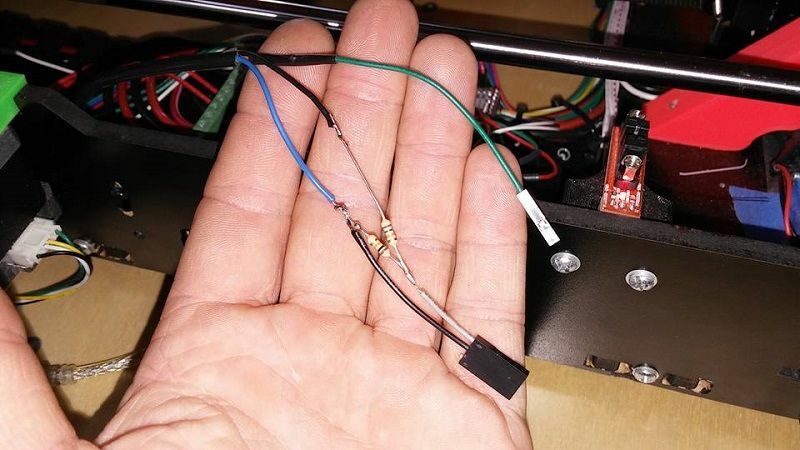 Ultimately it would be nice to have my printers and computer and everything stay powered off except for just a small 5v device like the pi and use the pi's gpio's to turn on the printer I want to use and then power it off after the print. This way there is no setup or prep just whenever I like wherever I like log into repetier server frontend and connect to whichever printer I want to use, turn it on, and watch it start printing. The biggest obstacle here for me is going to be setting up the software. I am learning as I go. And I have had multiple printers going at the same time off 1 pc with repetier. I just had multiple instances of it opened.